Cardiovascular disease risk is linked to your cardio-respiratory fitness level. People who lead a sedentary lifestyle are more prone to these risks as they have lower fitness levels. While it is not possible for everyone to be active throughout the day, walking is a great simple exercise that helps to improve your health and cardio-respiratory fitness in particular. Walking has several benefits. It helps to increase heart rate as well as lung capacity. Better circulation and breathing help to burn body fat and glucose, which lower weight. The main benefit of walking is for cardio-respiratory fitness. Walking not only improves heart rate but also makes the heart stronger and improves circulation. Having company while walking makes the task seem less tedious. So, asking friends or coworkers to come along with you for a walk isn’t a bad idea. Alternately, you could join a walking group or club. Since these groups go on regular walks, members often motivate each other. You could also take part in an organized fitness walk. An important motivating factor is comfort. Comfortable and well-fitting shoes and socks not only improve your walk but also make you feel good. Select a safe place where you would like to walk. In fair weather, walking in the open air in your neighborhood or around a park is a great idea. However, if the weather is bad, your walk need not stop. You could walk on a treadmill or find an indoor space such as a mall. Make sure that the place you select is well lit. Go shorter distances walking instead of driving or taking public transport. You could walk to school, to the grocery store, to work, take your dog for a walk and even run errands by foot. If you feel you do not have time to walk before or after working hours, use your breaks for walking. Instead of having coffee or a snack, take a walk. If your lunch break is long enough, you could squeeze in a walk before or after lunch as well. You could even walk in your workplace. For example, you could walk with a co-worker while brainstorming. Set walking goals and keep track of the number of steps taken. You could start with a modest target and gradually increase the number of steps to 10,000. There are several free phone and paid apps that help you keep track of your steps. Alternately, you could purchase a pedometer. 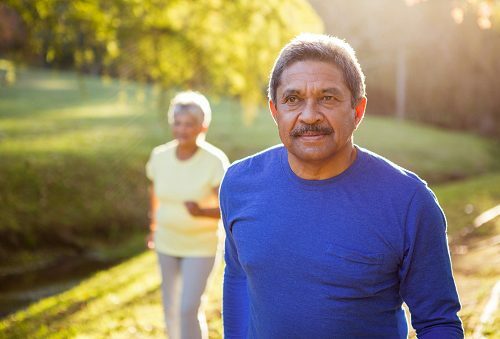 A recent study conducted by Thomas Yates at the University of Leicester showed how heart disease risk is not lowered only by walking, but is mainly affected by the pace of walking. Researchers studied 400,000 people over six years and found that those who walk slowly and those who had weak hand grip had a higher risk of heart disease-related mortality, compared to those who walk briskly. More precisely, the risk of mortality among those who walked slowly was two times those who walked briskly. This observation helped researchers to draw two conclusions, the first being that walking pace can be used as an indicator of physical fitness. The second conclusion was that brisk walking is more effective than slow walking if the risk of cardiovascular disease and mortality is to be reduced. Dr. Haitham Ahmed explained that those who walked at a brisk pace “had significantly lower cardiac and all-cause death” because they had better cardio-respiratory fitness. He recommends increasing the intensity of exercise. Dr. Ahmed also suggests combining aerobic exercise with weight training. This is because, after a certain age, one tends to lose muscle mass and becomes weaker. A combination of aerobic and resistance training can help to retain strength and maintain hand grip, which is also associated with cardiovascular risk. This should be done in addition to brisk walking.